The Selvick's addition to Michigan's Alger Underwater Preserve started during the spring of 1994, when Gary Cehlar heard the Selvick Marine Towing Company was looking to scrap the ship "Steven M Selvick". He had the idea that it would make a great shipwreck dive and began searching for a possible site to sink it. After finding out that Wisconsin no longer allows ships to be purposely sunk, Gary tried Pete Lunquest of Grand Island Tours in Munising, MI. Pete thought it was a great idea (at least at the time and does now, but was getting pretty skeptical during 1995). Pete and friends towed the Steven M Selvick from Sturgeon Bay to Soo St. Marie, around White Fish Point in Lake Superior and finally to Munising, MI. For two years divers from around the world helped Pete and the Alger Underwater Preserve Committee clean up the Steven M Selvick for it's sinking, there were almost 80 years of grease, grime, and oil covering the interior. By late spring of 1996, the Steven M Selvick was ready for it's next duty; the newest shipwreck at Michigan's Alger Underwater Preserve. On 01 June 1996 she was towed to Trout Point by the USPS tug Abraham W Williams and after a short ceremony MCed by Frederick Stonehouse, at 1:00 PM CDT became the first ship sunk by divers in the Great Lakes (the Canadian Government has sunk at least one ship for divers, but this was entirely done by divers!). To the amazement of all, there wasn't even the slightest hint of an oil slick after it went down. The Steven M Selvick is a "city class" tug built in Cleveland, Ohio in 1915. She was one of the last tugs to be constructed with a rivet hull. It was originally christened as a steam powere tug named the Lorain by the Great Lakes Towing Company. Later sold to the Merrit-Chapman-Scott Company in 1953, re-fitted with a diesel power plant and renamed to Cabot. 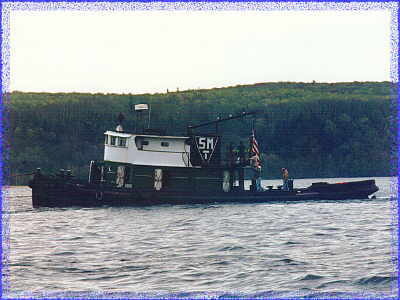 She was finally purchased by Selvick Marine Towing in 1988, re-fitted with a new Fairbanks-Morse diesel engine and renamed the Steven M Selvick.